And he said there is no surprise that there was a class divide in how people voted. “Those who gained little from the Celtic Tiger era were not swayed by promises from the Yes side of employment and prosperity. They knew their concerns about workers’ rights and other issues had not been addressed. “Those, particularly in the Labour Party and Fine Gael, who argued that economic salvation would come though a Yes vote will have to be held to account in that regard. “I have no doubt but that this Fianna Fáil-led government, boosted by today’s result, will feel empowered to implement savage policies, including a brutal Budget, NAMA and a range of cuts to social services as proposed in the McCarthy Report. “The problems facing Irish society will not, in any way, be resolved by today’s result. “Sinn Féin will continue to work for a better Europe – one that is more democratic and that puts the interests of ordinary citizens and workers above that of big business and bureaucrats. We will continue to work for a fairer Ireland and for an economy and a society that serves the interests of its citizens. Sinn Féin Vice-President Mary Lou McDonald said the ratification of the treaty will not solve Ireland’s economic problems and that those campaigners who promised jobs on the back of Lisbon must now deliver. “Sinn Féin fully accepts the decision of the electorate to ratify the Lisbon Treaty. However, the ratification of the treaty will not solve Ireland’s economic problems and there is an onus on those who promised jobs on the back of Lisbon to now deliver for communities and the unemployed. “There can be no doubt that the referendum result, aided and abetted by both Fine Gael and Labour, has breathed a new lease of life into this discredited Government. They will now attempt to force through their deeply unpopular and economically-flawed policies such as NAMA and the report from ‘An Bord Snip’ with all its cutbacks. Sinn Féin Dáil leader Caoimhghín Ó Caoláin said that, despite the “David and Goliath contest” between the No and Yes campaigns, Sinn Féin will not be calling for a further referendum on the Lisbon Treaty. And now that the Yes side has finished gloating over its success, it will now have to deliver on its promises of leading “from ruin to recovery” and “Yes to Jobs”. “Brian Cowen and his Fianna Fáil and Green Party government should take no solace from the result of this Lisbon Treaty referendum. 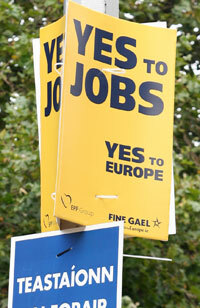 They and their Yes side supporters in Fine Gael and Labour now have to deliver. There is an onus, an obligation, on these Yes parties to demonstrate that their arguments had substance – that there will be economic recovery and real jobs created as a consequence of its endorsement by a significant section of the Irish electorate. “I, for one, do not believe a word of it. The only job that has been saved is Brian Cowen’s and just a couple of weeks back the European Commission approved a Polish Government proposal to grant aid, to the tune of €54.5 million, for the relocation from Ireland of 1,900 jobs in the IT sector. The referendum process, as a distinct element of our democratic system, has been seriously damaged by this government, the Sinn Féin Dáil leader maintained. “Some, understandably, have lost heart with the referendum process, if not with the democratic process in its entirety. Sinn Féin put up a fair and strong challenge to all the other political parties in the Yes coalition, the Cavan/Monaghan TD asserted. “We stuck to the facts regarding the Lisbon Treaty and we addressed the real issues of concern to the Irish people. “While this government and their Yes coalition partners, and their federalist friends in Europe, now have what they wanted, the fact remains that the economy has to be put right, that public services and workers’ rights, Irish neutrality and the interests of rural Ireland all have to be cherished, defended and nurtured now more than ever. “Government moves to introduce NAMA and to adopt all or even many of the McCarthy Report (‘An Bord Snip Nua’) recommendations must be resisted. These are deeply unpopular proposals for which this government has no mandate. “I challenge Brian Cowen, in the wake of his Lisbon 2 referendum success, to put his proposals before the people, either in a further referendum or, better still, in a general election before Christmas.